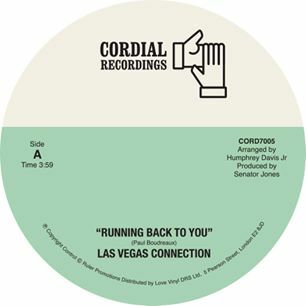 Featured Track: "CORD7005 "Running Back To You"/Give Me Your Love" 7'"
Our fifth release is the Las Vegas Connection, who were a New Orlean band from the 1970s that released two singles on Senator Jones ‘Hep Me.’ This will be a limited press of 500 units only which has been licensed through Warren Hildebrand and Mardi Gras Music. ‘Running Back To You’ is a glorious soulful dancer that has received plays in recent years on the rare soul scenes across the globe. On the flip is the uptempo disco grooved ‘Give Me Your Love’ with a luscious vocal delivery from Jackie Pettis.